Meanwhile, Real Madrid defender Pepe may also make the move to Asia in the summer. Arturo Vidal is wanted by Chelsea. Chelsea are preparing a move this summer for Bayern Munich’s Arturo Vidal, who is valued at £56 million (€66 million). The club are also believed to have had a £27m (€32m) bid for Atalanta’s Franck Kessie rejected, with the player dubbed ‘the new Yaya Toure’. Middlesbrough boss Aitor Karanka has confirmed that he wants to sign Jese Rodriguez from Paris Saint-Germain. The 23-year-old forward has been linked with a move to the Premier League and a return to La Liga, having struggled to adapt to life in Ligue 1 following a reported £21m (€25m) move from Real Madrid. Celtic boss Brendan Rodgers has warned Chelsea that they will not consider selling Craig Gordon before the close of the transfer window. The experienced Scotland international has been linked with a possible move to Stamford Bridge should the Premier League leaders decide to sell Asmir Begovic, who is a reported target for Bournemouth. Branislav Ivanovic looks set to leave Chelsea, and has offers from Zenit St Petersburg as well as three other Premier League to consider before leaving Stamford Bridge. It is understood that Chelsea and Ivanovic have yet to finalise any move, but that talks are ongoing between ‘several clubs’ and that a move is expected to be announced in the next few days. Leicester’s Islam Slimani could be the next high-profile footballer to move to China, with Tianjin preparing a £40m (€47m) bid. Real Madrid defender Pepe may also make the move to Asia in the summer. The Portuguese centre-back’s salary will be tripled if he moves to Hebei China Fortune. Without doubt one of Arsene Wenger’s most astute signings, Vieira was a relative unknown when the club bought him from Milan for just £3.5 million in 1996. Vieira went on to make over 200 appearances for the London club, winning three Premier League titles and four FA Cups in the process. After leaving the Gunners in 2005, the French midfielder had spells at Juventus, Inter and Man City before retiring. Vieira has since gone into management and is currently the coach of New York FC. Email “Chelsea target €66m Vidal, Chinese club want Leicester star and all today's transfer gossip”. 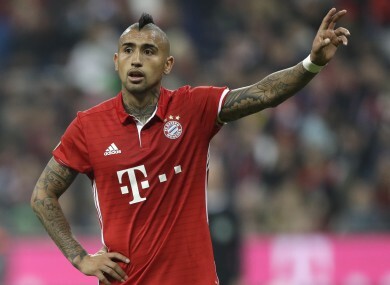 Feedback on “Chelsea target €66m Vidal, Chinese club want Leicester star and all today's transfer gossip”.